_ Primary aim of the WP1 is starting with activities aiming to create strategic basis for the development and implementation of the Master Programme "International and European Law". Curricula Analysis meeting was held in order to analyze the existing curricula sent by partners after desk and field study at their Universities. The aim is development of deeper than present (in the current curricula) academic involvement on the specific subject matter and stronger analytical approach, leading to higher overall academic excellence of future generations of master students in Russia and Ukraine. The third Curricula meeting took place in Kazan during the 2nd International conference "Legal reform and EU enlargement - transfer of experiences". At the Project Coordination Meeting representatives of co-beneficiaries discussed proposals of future master programme. It was stressed that future master programme must be in line with highest EU educational standards and be focused on courses which will contribute to development of labour market skills and raising of legal culture on the EU law. 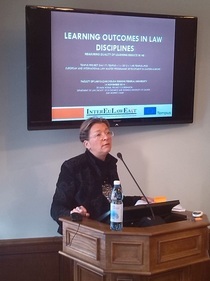 Within the Curricula Developement Professor Horak held the workshop on Learning outcomes in law disciplines as a important prerequisite for the further discussion on future Master Programme. It was emphasized that learning outcomes should be reflexion of labour market needs which stand in corelation with students needs. The discussion and the workshop are considered to be the guidliness for the future efforts on curricula developement and as a basis for preparing all relevant documents, teaching and methodological materials. Second curricula meeting took place in Zagreb during the Advanced Summer Course European Internal Market Law in June 2014. Consortium members discussed the proposal submitted by European experts and agreed on the key elements of draft curriculum. During the Curricula Analysis Meeting in Maribor it was generally agreed that all the consortium members from Partner Countries will submit revised in-depth desk and field study and give proposals about their vision of European Law and International Law courses by 15 March 2014 in order to establish European and International Law Master Degree Programme as the final aim of the Project. They should particularly take into account the obligatory courses (provided by state) and already existing elective courses, and emphasize to modifications and improvements that could be made. The consortium members agreed that the 2nd Meeting on curricula development will take place together with the Conference in Kazan, in September 2014.